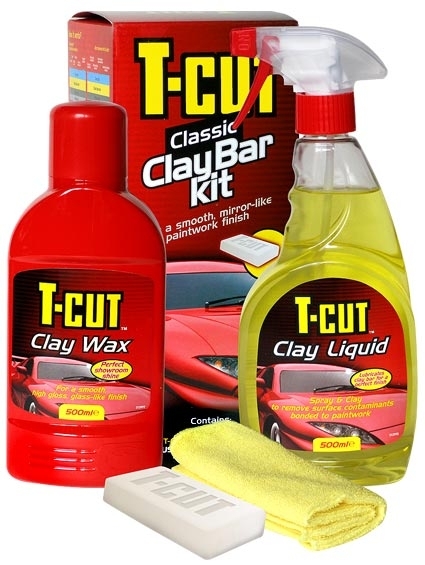 The T-Cut Clay Bar Kit is car cleaning’s best kept secret and it makes a really big difference to how your car’s paint looks and feels. This product will remove the most ingrained road debris, pollution and dirt. There is no better way to REALLY clean your paintwork than with a T-Cut Classic Clay Bar! T-Cut introduce their all new Classic Clay Bar Kit. Clay Bars create a smooth as glass, mirror like finish on all paintwork and increases the depth of shine when waxing or polishing. It helps to remove all surface contaminants and scratches leaving a smooth surface ready for waxing. Claying removes stubborn contaminants that ordinary shampooing cannot remove. This entry was posted in Uncategorized and tagged clay bar, dull paintwork. Bookmark the permalink.